First of all, I wanted to take a moment to mark a milestone in my blogging career. This post (the one that you are reading right now) is officially my 100th post. That means that, on 100 separate occasions, I decided to sit down and waste your time with nonsensical ramblings and egomaniacal manifestos. My thanks to all of you (that is to say, all three of you) who continue to take in this load of crap, despite the fact that I only ever post three to four times a week, depending on how lazy I feel. Today, though, I will spurn my natural tendency towards laziness. Because I must deliver on a promise; a promise that I made to all (three) of you yesterday. Ladies and gentlemen, sickness is rampant. I was out of the office with a stomach flu on Tuesday. People all over the office where I work have been missing because of various winter-related illnesses. Indeed, our very world seems ill. The global economy may well have the flu, our politics suffer from an excess of phlegm, and foreign policy appears to have a chronic case of explosive gastrointestinal distress. The Earth itself may have a fever or, at the very least, a substance abuse problem. In short, we are all in need of some serious medication. But where can we go to find that wonderful panacea, that miracle drug that will fix all of our problems? God, he's so CUTE! Look at that little smile! How can that not warm your heart and make you feel like everything is going to be okay? 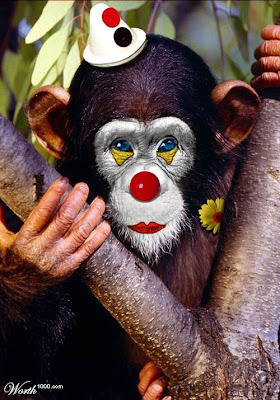 Whenever you're feeling ill, or worried about the impending collapse of civilization around you, just look at the happy clown-monkey. Go ahead, stare into it's computer altered baby-blue eyes. Go ahead. I'll wait. Aaah. See? Now that's good healing.